I don’t happen to believe that the Marx Brothers sat naked in Irving Thalberg’s office and roasted potatoes, but show business legends die hard, so who am I to spoil everyone’s fun by saying this particular anecdote creeps me out and always has. Still, it dovetails nicely with 60’s era protest gestures applauded in yellowed editions of Ramparts magazine. Maybe Groucho understood this when he repeated the tale for collegiate disciples dogging his senior years. So who among the team’s army of madcap scribes dreamed up this offscreen japery, and when? I’m figuring it was planted in a column just prior to release of A Night At The Opera, or soon thereafter. If the team was to be gelded in front of Metro cameras, then at least preserve Marx madness behind them. This viewer enjoyed a boyhood diet limited to their Paramount features. I didn’t come by way of A Night At The Opera until 1973. Funny how you remember best those classics that don’t deliver. At nineteen, I wondered if it was me or the movie. Groucho playing Cupid --- that seemed a violation of everything he stood for. Harpo the happy clown smashes his fingers under a piano lid and gaggles of Metro moppets laugh themselves silly --- sacrilege! Songs, dancing, and romancing. This was the dreaded laxative after a bountiful meal of Duck Soup. So what of the alleged flop of the latter? Did Duck Soup curdle and resolve Paramount to rid itself of Marxes? 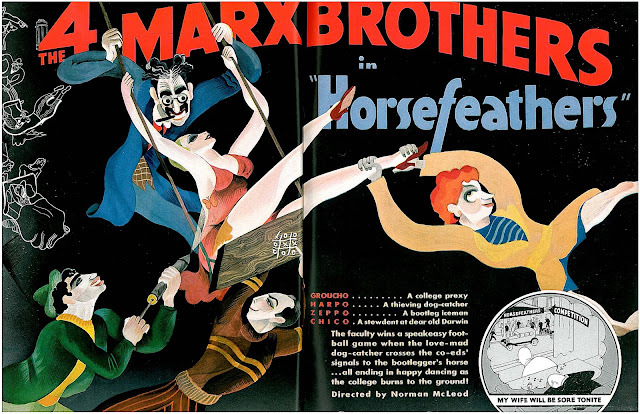 I don’t have gross figures any more than writers over forty years who’ve accepted received wisdom (itself dating back to columns of the day), but I do have a few for Horse Feathers, and that was sure enough the company’s number one hit for 1932. At a negative cost of $647,000, the college comedy took a whopping (for 1932) $945,000 in domestic rentals. That was significantly better than runner-ups Shanghai Express ($827,000), The Big Broadcast ($775,000), and Love Me Tonight ($685,000). Co-ed hijinks spiced with Thelma Todd in negligees and a climactic football game would seem a safer bet than political satire, but was Duck Soup a total bust? I’m as curious as any Marx fan, and lest Paramount elects to open their ledgers for Greenbriar’s benefit, will probably remain so. One elusive number has surfaced, however. Turns out Duck Soup’s negative cost was $765,000. Did Paramount spend themselves into a corner? Rife had been conflict between stars and studio since Gummo Marx visited from New York and discovered monkey business on the part of Paramount bookkeepers during shooting of the 1931 feature of the same name. Seems Para forgot profit percentages due the Brothers. 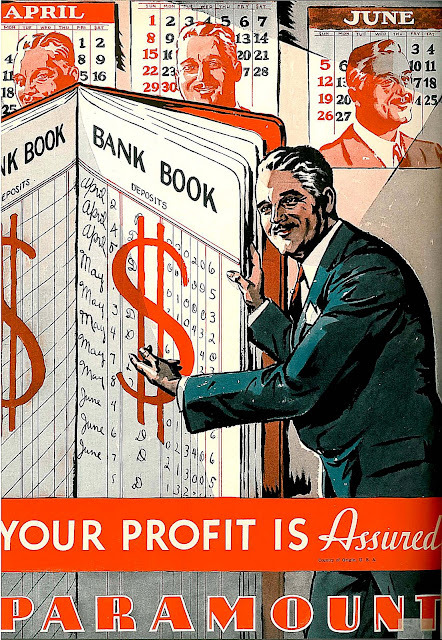 Matters simmered through much of 1932 as Gummo sought a proper accounting. The team decamped to New York despite preparations being made for Duck Soup. Paramount’s countersuit claimed the Marxes owed them a picture and were refusing to honor their contract. 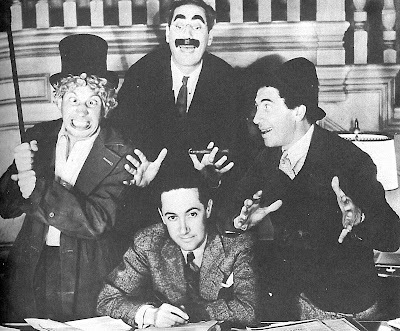 By May 1933, matters was uneasily settled and the comedians, including Groucho and Zeppo (shown with reader identified Gummo aboard the 20th Century Limited here), returned to California to shoot Duck Soup. Overhead piled up before Summer filming began. The Marxes were at least the most expensive comedians on this studio’s payroll. $765,000 exceeded money spent elsewhere on bigger pictures. Consider that MGM had $700,000 in Grand Hotel, Warners managed Golddiggers Of 1933 on a $433,000 negative cost, and RKO finished King Kong for just $672,000. Paramount’s own investment in other comedies was considerably less than Duck Soup. The all-star International House came in at just $337,838. Monies needed to wrap Mae West’s hit I’m No Angel amounted to $434,8000, and W.C. Fields in Tillie and Gus was done for a modest $235,000. 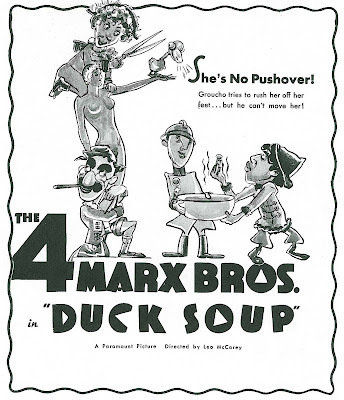 The fact is that Paramount, even if it maintained a solid following for its Marx Brothers series, could never hope to profit in the face of expenses like those incurred on Duck Soup. Besides, there were plenty of other laugh-makers on hand to fill the void. 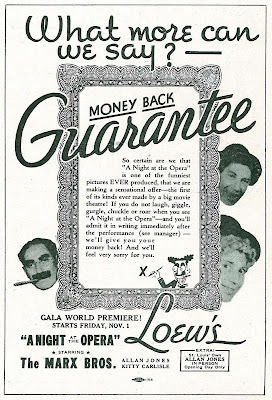 Word was out that Duck Soup was a flop, but this wasn’t altogether fair to the Marx Brothers. The long wait of three or so decades to have their final Paramount offering declared one of the greatest sound comedies was hopefully worth it. Groucho acknowledged as much in old age. The deal for A Night At The Opera seems to have had its genesis during bridge game conversation between Chico Marx and Irving Thalberg. The comedians had been off movie screens for going on two years and their confidence was shaken. A proposed independent start-up had piled on (financing) rocks, and it was figured the Marxes had lost their momentum. Thalberg made it clear to Groucho that his was a salvage job. These were comedians in need of new direction, and any deal with Metro would be conditioned upon their accepting that reality. Duck Soup was "lousy," said Thalberg, to which Groucho could but meekly disagree. I can produce a Marx Brothers comedy with half the laughs that will do twice the business, promised Thalberg. His idea was really nothing new. He’d simply reapply the stage formula used in The Cocoanuts and Animal Crackers, only this time romantic subplots would figure more prominently. There was such a thing as too many laughs, after all. Morrie Ryskind would sum it up while the team was still on Broadway: You didn’t have ice cream all the way through, you know. Feckless stage juveniles had been a necessary conveyance for songs an audience might whistle going home and buy sheet music for the next day. Love stories functioned quite apart from the Marx Brothers and they seldom overlapped. Thalberg was resolved to integrate the two, even if it meant watering down the comedy. This would, at the least, have greater appeal for women. Vulgar and unrelieved laughter was best left to two-reel fillers. A Night At the Opera would deliver on the promise of its title. There would indeed be opera, and per Thalberg’s dictum, we’d take it and like it. A shame no one referred back to the Paramount model, for they had fixed whatever needed fixing with the Marx Brothers. Monkey Business, Horse Feathers, and Duck Soup got out wrinkles inherent in Broadway hits now passé to sophisticated talkie viewers. Each was better than the one before, with Duck Soup a most polished diamond. Thalberg and MGM sought to reinvent that wheel. Their newly hired comedy team went on the road to get live audience confirmation of what exhausted writers hoped might be funny. A half dozen features could have been made from screenplays discarded by Thalberg. How does one honestly know what works after a hundred or so readings and redraftings? One writer auditioned material for Thalberg, who scanned the pages without cracking a smile, then turned to the man and announced, "This is the funniest material I’ve ever read." That story has been repeated to Thalberg’s disadvantage, with emphasis on his tin ear for comedy, but many’s the feature and short I have watched without laughing, yet rank among favorites, evidence I suppose that we don’t necessarily guffaw at everything we find funny. Sometimes an approving smile is expression enough, though comedies shared with an audience do have ways of breaking down inhibition. A Night At The Opera’s live act was fifty minutes of proposed highlights for the feature. The Marxes played it four times a day in scattered theatres and spent intervals figuring out what to save for the movie. Audience response determined keeper gags. If corporate-applied scientific principles got maximum efficiency out of car assembly plants and grocery chains, why not comedy? Thalberg instructed director Sam Wood to shoot A Night At The Opera from every conceivable angle. Thirty or more takes was the enervating norm. The Marx Brothers must have been sick to death of this material once they finally got it down on film. 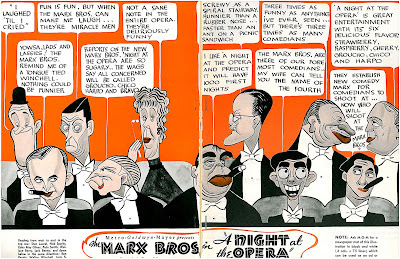 A Night At The Opera was specifically edited for packed houses. Pauses for laughs break up each routine, much as they would in the later Hope/Crosby road comedies, also designed for large audiences. No wonder some of these play sluggish when you’re watching alone. Isn' that Gummo, rather than a brother-in-law, in the photo with Groucho and Zeppo? As for "Duck Soup"'s alleged failure... is it possible that audiences had become overly-familiar with the formula? First scene: Groucho and Zeppo. Second scene: Harpo and Chico. Third scene: Groucho and Chico. And so on. I've read the original treatment -- Zeppo was Groucho's son, just like in "Horsefeathers"! What I find more interesting is that the Marxes made only one movie a year, while Paramount put W.C. Fields in two or three (or four?) It was the same at MGM. Were the Marxes wary of overexposure? Hi East Side --- The photo caption says it's an "unidentified" brother-in-law, but I'll bet you're right --- it probably is Gummo. I am curious - - perhaps the Greenbriar Theatre knows - - is the DVD of HORSEFEATHERS (and I am assuming the print that shows up on TV from time to time) a chopped-down version of the original release? I am fascinated by the discussions about "negative" cost, but I often find the nagging question: did the studio pad the costs on some films? 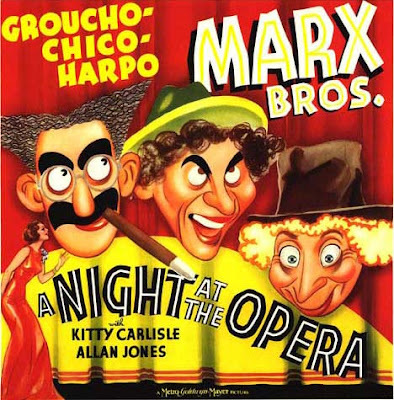 I like "Night at the Opera" a lot, but it does not compare to DUCK SOUP or HORSEFEATHERS. 'Opera' seems over-rehearsed in places, like I am seeing take #42 in some scenes... judging by your comments, maybe that is the case. Side-note - - I was looking at some 1981 newspaper clips of an interview with Barb Stanwyck, and her agent was Zeppo Marx. Greetings Erik --- Every "Horse Feathers" I've seen has been chopped up in parts. Really a shame, but I suppose it will remain that way. To your theory that studios padded costs, I agree. That sort of thing has always gone on, I guess. Thanks for the info on Zeppo representing Barbara Stanwyck. I didn't realize he had such an important client as late as the seventies. As late as the 1950s, the BBC was broadcasting the "un-chopped" Horsefeathers. The scene in Thelma Todd's room was three minutes longer, with Harpo returning and Groucho falling out the window. I wonder if a print can still be found in its archives. I have no direct info but based on what I've gleaned over the years Paramount was one of the crookedest studios in Hollywood. That the real conflict with the Marx Brothers and paramount was over their accounting practices makes perfect sense to me. 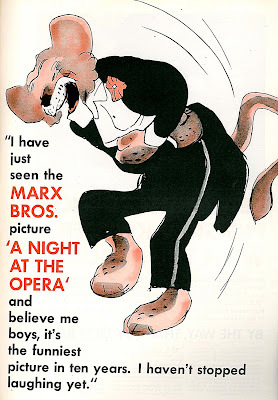 Also I am glad that I'm not the only one who found the MGM Marx movies to be inferior. ALL of the Paramount films have so much joy in them and the MGM films are so straightjacketed. Even when there are really good bits in the films there is a really condescending air to them. Check out the treatment of blacks in A DAY AT THE RACES and Italians in THE BIG STORE. I actually prefer A NIGHT IN CASABLANCA to most of the MGM films. Now this may be a case of "it's just you, Spence" but that's how I feel. Contrary to popular opinion, the idea of mixing madcap humor AND music AND romance can be successfully achieved. The key is to have a star who is both a funny comic and a convincing romantic lead who can sing. RKO got all that in the person of Bert Wheeler. Though mostly just known by cinephiles today, the Wheeler & (Robert) Woolsey comedies were actually tremendous box office successes. In fact, they were the #2 1930s comedy team at the box office, second only to Laurel & Hardy. A few times in movie-to-movie combat, they even outgrossed Stan and Ollie. 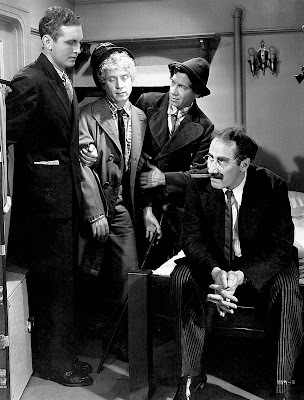 But this "funny leading man who can sing" approach could never work with the Marx Brothers, because your only choice would be Zeppo, who could be funny but let's face it, next to the other 3 even some of his jokes came off like straight lines. Zeppo, who could be romantic, but always seemed like he might be feeding the ladies a line until the next one caught his eye. Zeppo, who could sing nicely enough, but perfunctory at best. I'd love to see you run a piece on Wheeler and Woolsey sometime, as well as those other purveyors of "nut humor," Olsen & Johnson (who granted, broke more Broadway box office records than movies). I also lament the fractured "Horsefeathers" we've been left with. It's my all-time favorite Marx film. If my memory serves correctly, I read on a newsgroup somewhere that extant copies of the film existed up through the early TV age, but soon after is when things got botched up. I'll have to look that up again to see if there was a full explanation or my memory is playing tricks on me. I too prefer the Paramount Marxes to the MGMs, but just for the record (and not that you asked), my own favorite is Animal Crackers; but then, I prefer A Day at the Races to A Night at the Opera, so take that for what it's worth. And just in case some of your readers haven't heard the story, there's that classic anecdote about director Mike Nichols meeting Groucho in the 1960s or '70s. He told Groucho that he'd seen A Night at the Opera an amazing (in those pre-video days) twenty-five times. Groucho, surprised and touched, said "Really?" "Yeah," said Nichols, "I just can't get enough of that love story between Kitty Carlisle and Allan Jones!" I love Duck Soup but your article overlooks the fact that the popular opinion of Duck Soup at the time of release was that it was too disorganized, zany and had no point. In other words it was a bad movie. Nat Perrin, one of the writers thought that. So Thalberg only did what everyone thought was necessary at the time: sympathetic characters and an actual plot. I thought that everyone regarded the the Paramount films as superior? The picture on the back of the train is of Gummo. Besides, there were no Marx sisters. Also, I 've heard that Zeppo could be equally, if not funnier than his brothers. I was not unheard of for Zeppo to take over Groucho's role on stage. That didn't occur to me until you mentioned it. I went by the original caption with the still. Several other readers have ID'ed Gummo, so I'm satisfied --- and grateful for the clarification. As a bona fide "Zeppophile" (try looking THAT one up! ), I prefer the Paramounts simply because he's in them, as opposed to Allan Jones, Kenny Baker, Tony Martin, ad nauseum. One of the best 'takes' on Zeppo can be read at his Wikipedia entry. 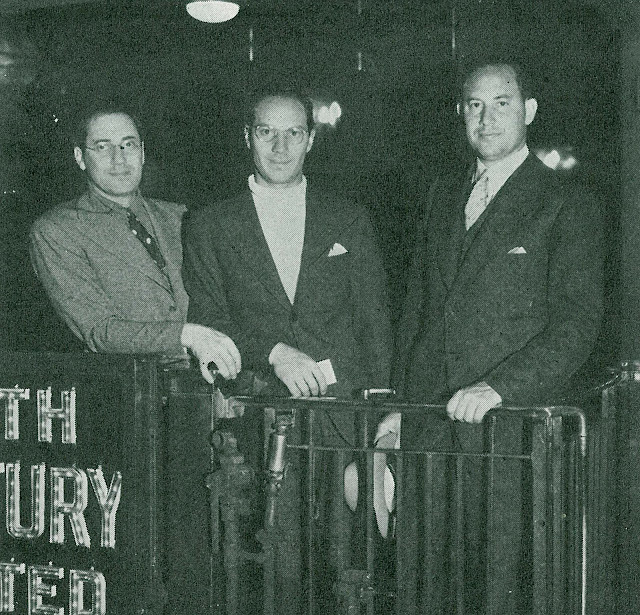 The Barbara Stanwyck article referred to the distant past: Zeppo sold his agency to MCA in the mid-forties. 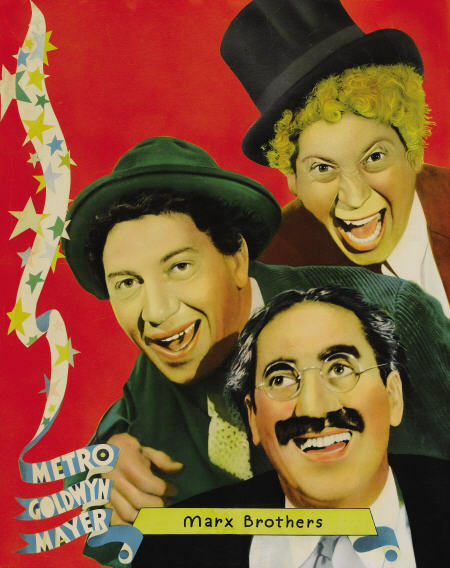 In his book "Monkey Business: The Lives and Legends of the Marx Brothers" (1999), Simon Louvish writes: "'Duck Soup,' contrary to legend, was not a flop, but it was not as big a hit as 'Horse Feathers,' being 'merely' the company's fifth largest grosser of 1933." Unfortunately, the item is not footnoted, so I don't know where he got his information. Michael --- Just read that Zeppo entry you mentioned. Very good piece. Thanks for the referral, and your further comments on the Marxes at Paramount.